Showing 41 articles from October 10, 2018. LOUISBURG -- Franklin County has waited for more comprehensive health care ever since Novant Health shut its doors on Oct. 16, 2015. Thanks to some legislative changes, some state funding and a collaboration between Duke Lifepoint and Maria Parham, health care officials were poised to open their emergency room doors to new customers this past Monday. LOUISBURG -- Only two Franklin County residents spoke at a public hearing about federal oversight of the county's schools during Monday night's board of education meeting -- and although they asked questions about the proposed changes, neither voiced any opposition. Earlier this year, a federal court judge has tentatively agreed with the Franklin County Board of Education and the U.S. Department of Justice about significantly lessening federal oversight of the county's schools. 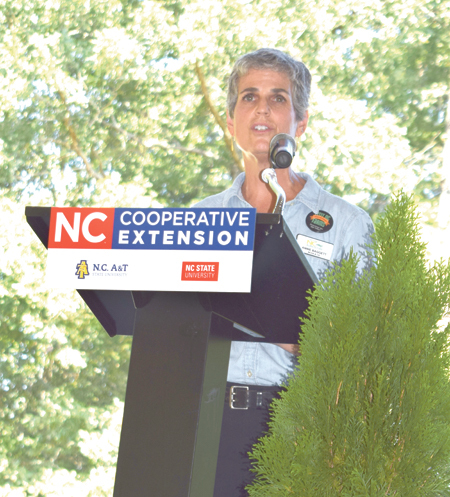 BUNN -- It takes special people to survive and thrive in agriculture, Cooperative Extension officials and staff said last week. 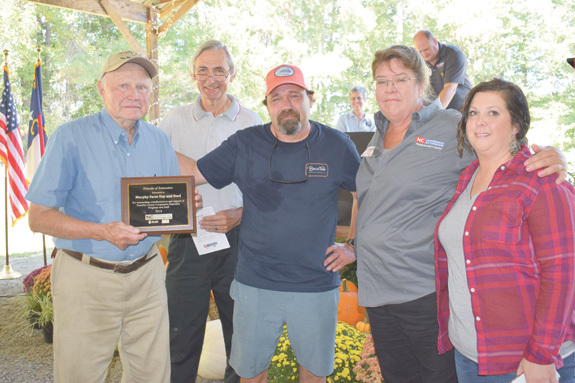 During their annual Farm City Lunch -- an event to highlight farmers and recognize their relationship with those in urban cores -- the extension staff recognized those who have gone above and beyond by handing out several awards during the event hosted at Vollmer Farm. 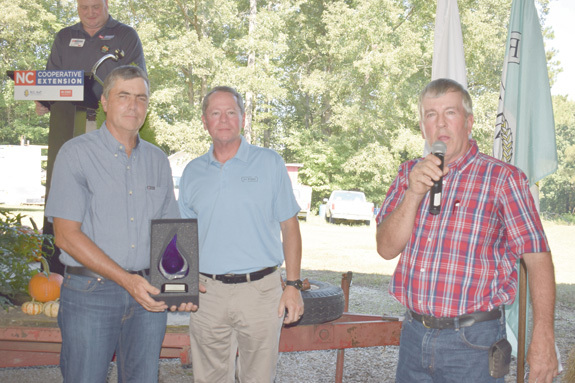 Jeff Wood, left, received the Conservation Stewardship Award on behalf of his Wood Farm Partnership in Centerville. Presenting the award are Soil and Water Conservation Vice Chair Brent Strickland, right, and Randy Green with Novozymes, one of the award's sponsors. LOUISBURG -- Man's best friend turned out to be a lifesaver for a Franklin County family over the weekend. 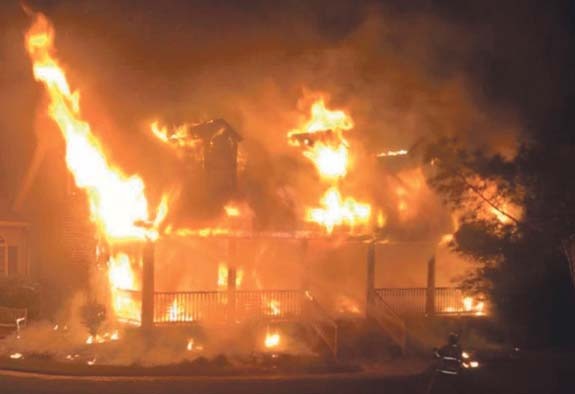 Louisburg firefighters responded to a home in the 100 block of Arrowhead Court just after 5:15 a.m. on Oct. 7 to find a house fully engulfed and the occupants exiting the structure. 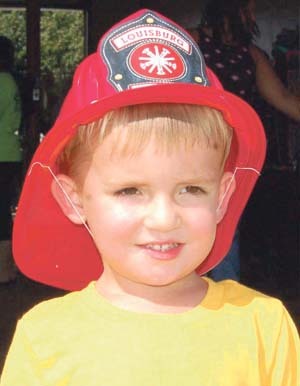 It wasn't the smoke alarm that initially alerted the Murphy family to danger -- it was their dog. 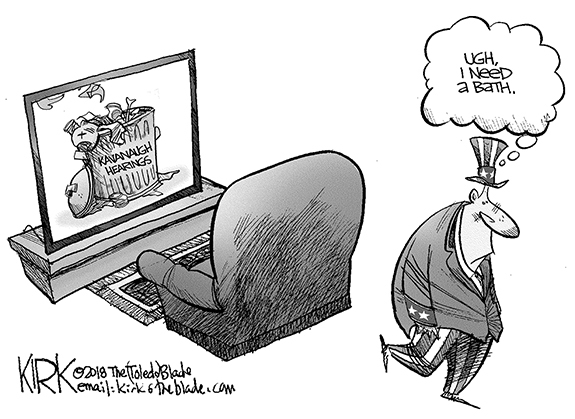 Sadly, what you can't see can make you very ill! This is a terrible time to bring this up, especially since we've all been enjoying almost picture-perfect October weather. October is perhaps my favorite month. The weather is great, there are lots of festivals and other events outdoors and, by the end of the month around here, the scenery has taken on red, orange and yellow hues that signal major changes in the offing. But one of those changes just ain't no fun -- but there may be ways to help mitigate its effects. Ladies, be sure to get tested; Gents, make certain they do! Breast cancer is one of the leading cancers afflicting women worldwide. But it's important to underscore the fact that it is not a disease that affects only women because husbands, boyfriends, children, grandchildren and many, many others feel the effects of the dreaded diagnosis. Hurricane Flo fatigue?!? Make way for Michael! Still left wobbly by Hurricane Florence, which stomped its way through eastern and southern North Carolina, bringing tons of rain and disaster, residents there are now looking Hurricane Michael squarely in the face. The storm was expected to make landfall in Florida as a Category 3 storm with 120 mph winds on Wednesday. On Tuesday, Nov. 6, our country will once again have the opportunity to select the next group of elected officials who will lead our country in Washington, D.C., our state capital and right here in our local communities. 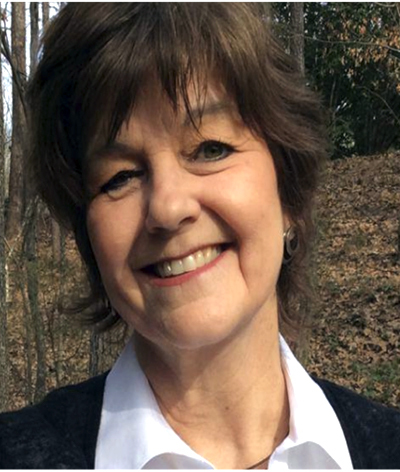 FRANKLINTON-- Lori Napier Haley died Friday, Oct. 5, 2018 at the age of 57. She was born on Dec. 6, 1960 in Kansas to the late Joseph Earl and Etta Button Canfield. WAKE FOREST--Virginia May Mathis, 102, formerly of Cocoa Beach, Fla., died Tuesday, October 9, 2018 in Wake Forest, NC at the Carillon Assisted Living residence. LOUISBURG--Willie C. Brodie, 95, died Thursday, Oct. 4, 2018 at his home. Funeral services were held Monday, Oct. 8, at Walnut Grove Baptist Church, Louisburg. Burial followed in the church cemetery. HELD UP. 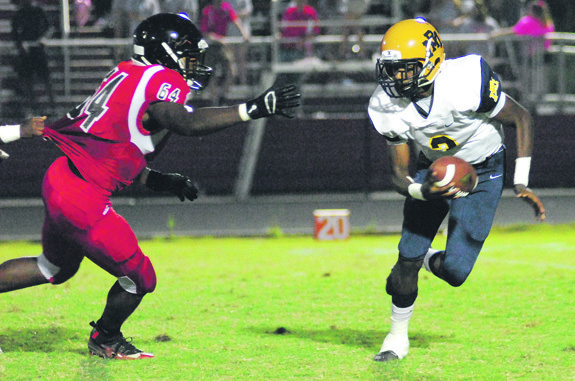 Despite having his jersey grabbed by an offensive lineman, Franklinton defender Mike Rogers chases Rocky Mount quarterback Jaquan Lynch during last Friday's Big East Conference matchup. FRANKLINTON -- Thanks to its overall program improvement and surging confidence level, Franklinton had a good feeling about the prospect of bettering last season's 34-point loss to Big East Conference rival Rocky Mount. And for one half, the Red Rams lived up to that promise -- only to see the touted Gryphons pull away in the second half of action during last Friday's meeting at the FHS Football Field. BACKHAND BASH. Franklinton High School No. 6 Singles player Jeanna Vordran returns a shot last Wednesday against league foe Northern Nash. 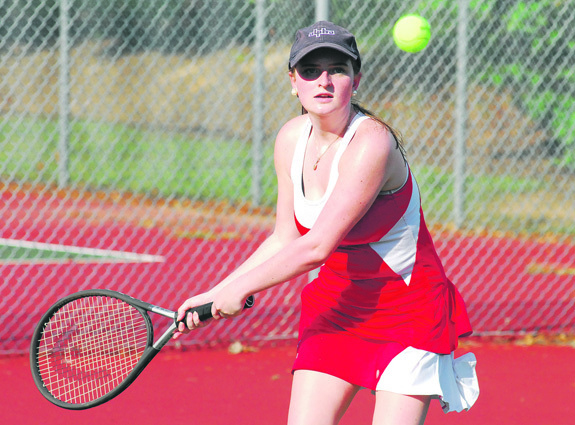 RED OAK -- Franklinton is still looking for that elusive first victory in the Big East Conference girls tennis standings, but the Lady Rams are certainly making things more interesting these days. Despite being 0-10 in the ultra-competitive league, Franklinton has had its share of heroics this fall, including a 6-3 road loss last Wednesday against a strong Northern Nash squad. DOWN IT GOES. 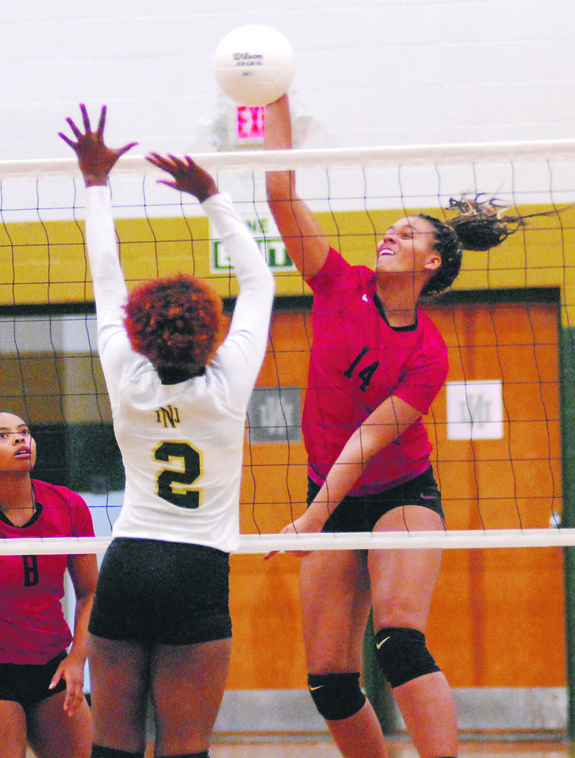 Franklinton's Larissa Johnson (right) sends down a kill last Thursday against Northern Nash. RED OAK -- There was plenty to celebrate -- at least during pre-match ceremonies -- last Thursday for the Northern Nash Lady Knights as they honored six volleyball seniors at the NNHS Gymnasium. But the festive nature of the occasion stopped once the match started as the Lady Knights proved to be no match for Big East Conference leader and defending champion Franklinton. 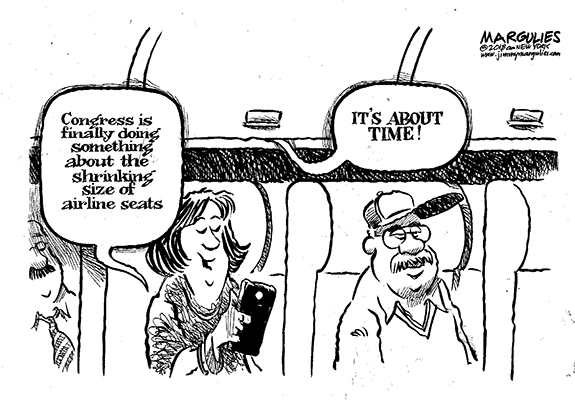 SPEED UP THE WING. Rachel Alford (right) uses her speed to create plenty of offensive chances for the Bunn Ladycats, including this one during a match last year versus Southern Nash. 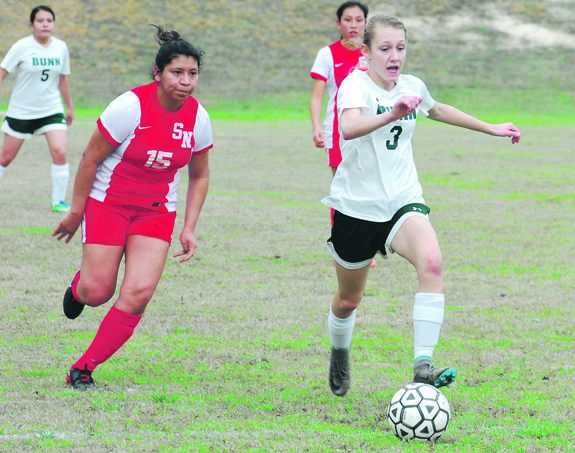 BUNN -- Back in the spring, Rachel Alford made a verbal commitment to continue her soccer career at William Peace University -- and she never wavered from that plan. A signing opportunity, however, would not come until several months later due to NCAA rules. HENDERSON -- The early candidate for the Game of the Year in the Northern Carolina Conference was staged last Friday night. It will also be remembered as one of the wildest ones this season as Bunn survived two overtimes to edge homestanding Vance County by a 44-42 margin in a key NCC meeting at the VC Football Field. ROANOKE RAPIDS -- Louisburg entered last Friday's Northern Carolina Conference showdown at Roanoke Rapids with a two-game winning streak -- and plenty of optimism for a strong finish to the 2018 football campaign. But the feel-good portion of LHS' season evaporated quickly as the Warriors were defeated by the Jackets by a 42-0 margin in a lopsided affair at RR's historic Hoyle Field. ZEBULON -- The Carolina Mudcats, Class-A Advanced affiliate of the Milwaukee Brewers, have announced their new 2019 Carolina League season schedule, which begins on April 4 in Kinston versus the Down East Wood Ducks and continues with the club's home opener at Five County Stadium on April 11 against the Wilmington Blue Rocks. WILSON -- Franklinton High School took third place in the team standings at Monday's Big East Conference Golf Championships at Wedgewood Country Club. The Lady Rams closed with 376 strokes to outlast Wilson Fike (418) for the No. 3 spot. Sara Kenney led the way for FHS with a 119 over the 18-hole layout. She was followed by teammates Lily Puett (128), Samantha Bishop (129) and Isabella Henry (131). 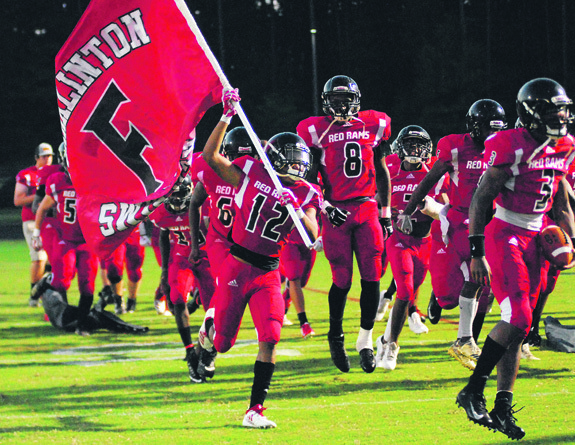 Lyeshon Parker (carrying flag) leads the Franklinton Red Rams on to the field before last Friday night's home football meeting with the Rocky Mount Gryphons. 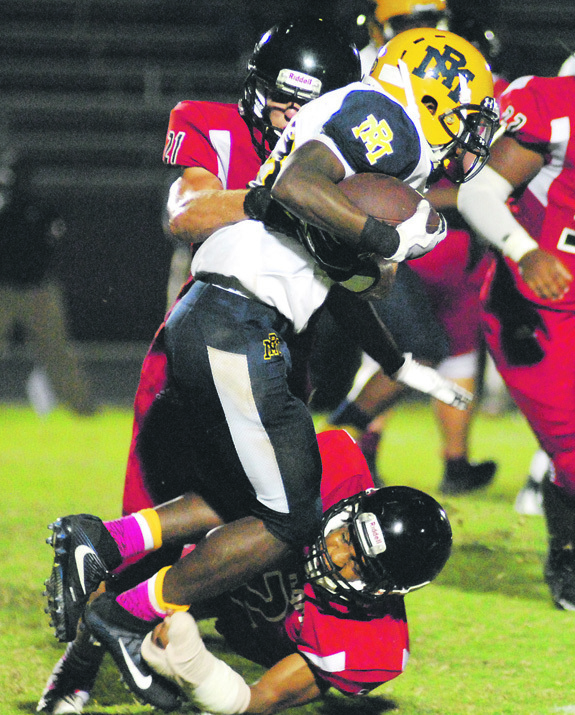 Franklinton High School's Kendrick Holt and Parker Coats team up for a tackle during the Red Rams' home football contest last Friday night against the Rocky Mount Gryphons. The inaugural event of the Sidney Stafford Lecture Series to honor the life and work of the late Rev. Sidney Stafford, longest serving chaplain of Louisburg College, will be held at 7 p.m. Wednesday, Oct. 17, in the Norris Theater of Louisburg College. The guest speaker is Dr. Nancy K. MacLean, an American historian. 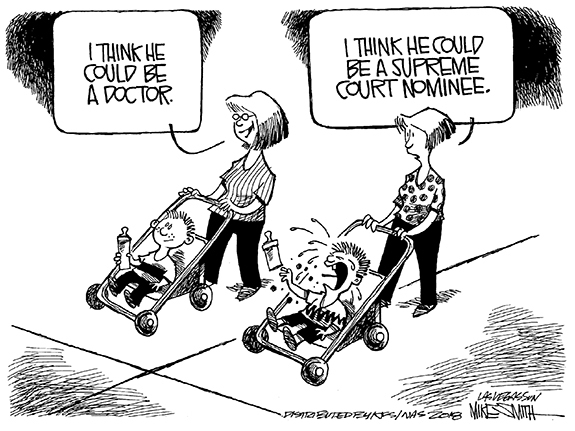 She is the William H. Chafe Professor of History and Public Policy at Duke University. As the days become shorter and the weather cools down, a new crop of allergy symptoms can arise, turning the autumn season into one marked by sneezing, scratchy throats and itchy eyes. Medications can alleviate such symptoms, but allergy sufferers may want to investigate some natural ways to beat allergies. According to the American College of Allergy, Asthma & Immunology, ragweed is one of the more common triggers of autumnal allergies. Children's eye health is just as important as other aspects of their physical and mental well-being. According to a recent report from the National Center for Children's Vision and Eye Health at Prevent Blindness, vision plays an important role in a child's physical, cognitive and social development. And visual functioning is a strong predictor of academic performance in school-aged children. 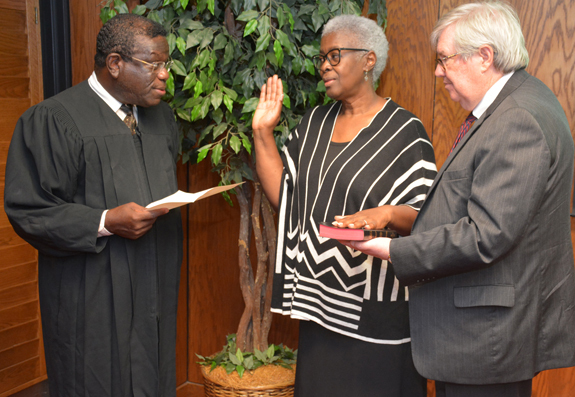 HENDERSON -- The Vance-Granville Community College Board of Trustees approved a firm to assist in the search for a new president, adopted a budget for the current fiscal year, and welcomed a trustee who is returning to the board after being away for two years. The actions came at the bi-monthly meeting on Monday, Sept. 17, on the college's main campus. 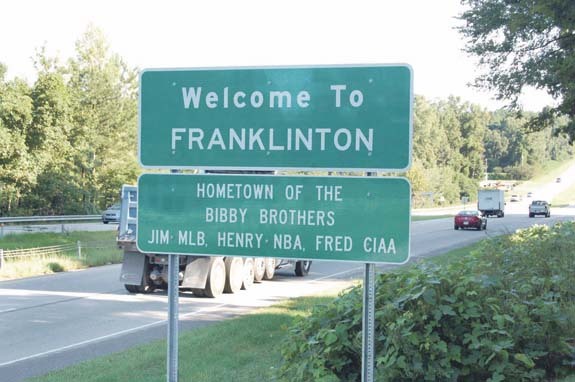 FRANKLINTON -- On Saturday, the community will dedicate its "Welcome to Franklinton" signs that recognize a trio of brothers who made a name for themselves far beyond the small town in western Franklin County. FRANKLINTON -- A death last month attributed to a fatal reaction to fire ant bites has health department officials re-emphasizing the danger the tiny insects can cause. According to reports, Floyd Edwards was cutting some overgrown brush when his blade got stuck on wire. When he got out from under the mower, he complained of shortness of breath and his tongue began to swell -- signs of an allergic reaction. 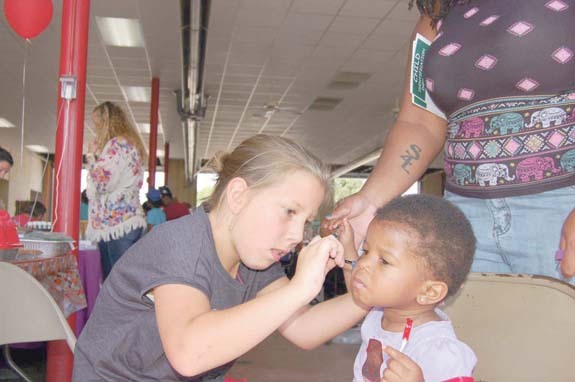 In a move that reportedly caught many by surprise -- especially parents and grandparents, the trustees of Vance Granville community College voted recently to close the school's vaunted Five Star-rated Child Care Center on the Franklin County campus. The school will keep the child care center on its Vance County campus and, reportedly, move some of the staff and equipment from Franklin County to that site. HONORING THOSE WHO SERVE. 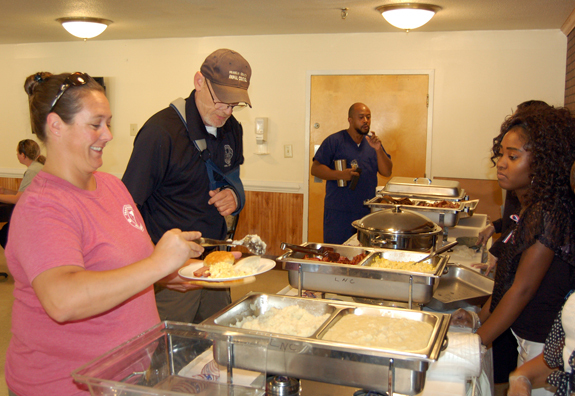 In remembrance of Sept. 11 attacks and in honor of law enforcement, fire and rescue departments, Louisburg Healthcare & Rehabilitation Center of Louisburg held a special 9/11 breakfast. In attendance, Animal Control Director Lynn Bowling and Animal Control Officer Dannie Howard in meal line. LOUISBURG -- Sheriff's deputies arrested a Louisburg man on 15 felony drug and gun charges. 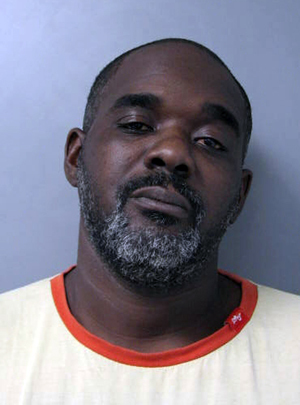 Scottie Maurice Gallatin was charged with four counts of possession with the intent to sell and deliver cocaine, five counts of selling cocaine, five counts of maintaining a dwelling for the purpose of selling cocaine, possession of a firearm by felon, and possessing for sale alcoholic beverages without obtaining an ABC permit, an Alcohol Law Enforcement charge. Is an app where it's at for farmers? BUNN -- There are certain tools a farmer can't do without. A hoe comes to mind. So do shovels. A tractor, sprayer, cultivator, seeder or tiller can make much easier the backbreaking work familiar to farmers. 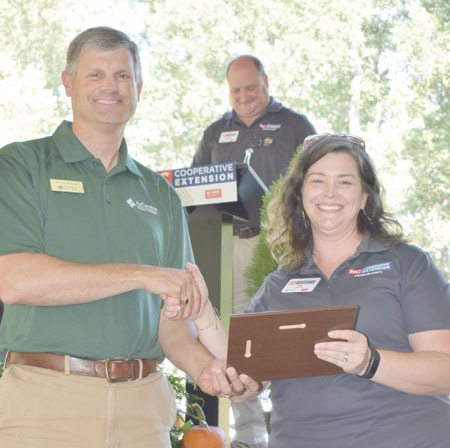 Last week, Annie Baggett said, hopefully, a smartphone will become just as important a farming implement as the backhoe. 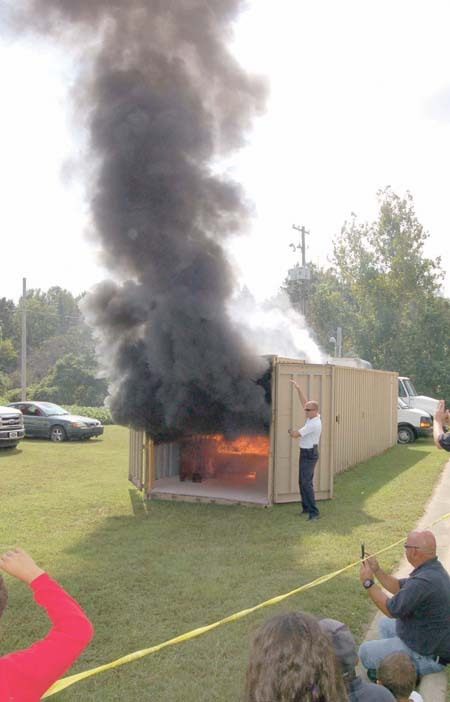 A live-burn demonstration sent flames high into the sky. Zoey Webber focuses on the painted face of Sarah Robinson. 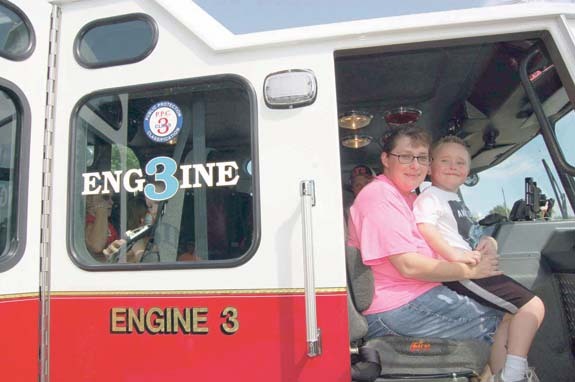 Lila and Liam Page get ready for a ride in a fire truck. Above, 4-H Agent Meg Wyatt, right, presented the 4-H VOY Award to AgCarolina's Elizabeth McAuslan. Coworker Scott Reece accepted for her. 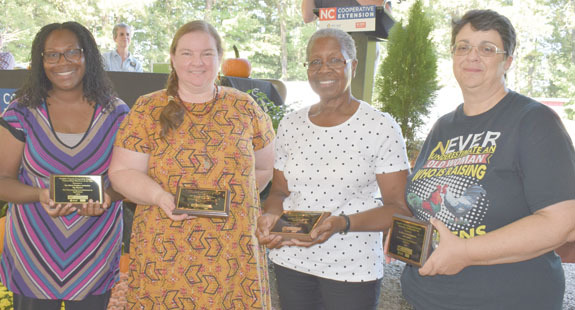 From left, Tay Brown, Analee Thornburg, Patricia Hill and Julie Gupton received the Cooperative Extension's Ag Volunteer of the Year Award for their business efforts to secure a mobile poultry processing unit, using it to aid small farmers and educate others about food safety.